In the morning we were able to visit an acupuncture clinic. The clinic was much smaller than the hospital but they were especially welcoming and friendly. There was much more room to observe as a group as well. We were able to see patients being treated with acupunture, e-stim, cupping and tui-na massage. In the hallway I talked with a local farmer who travels to the clinic weekly. He said that he used to go to the hospital that we visited yesterday but hates it there. He said that they just gave him the same patent pills over and over to treat his back pain. The results weren't that great. He said, "That place isn't a hospital, it's a shopping mall! they don't treat you as a patient, your just a number in line there." He enjoyed going to the clinic and said his treatments were getting results now. We later said thanks to the doctors there and stopped for a quick group picture before heading out. After lunch a few of us went with Robert to hike Zi Jing Mtn. with our local guide Sean. We climbed most of the mountain and got to see several medicinal plants in the wild before the rain started to come down. We then hustled back down to ahve the bus pick us up. Dinner was at the same restaurant as yesterday, only we had a special meal cooked with medicinal herbs. While there were some novelty dishs such as Bitter Mellon (pretty spicy and darn bitter) and Pig Lung Soup (actually really tasty), the meal was really good. We had fun guessing some of the herbal ingredients before Yulien was kind enought to translate to menu to tell us what was really in the meal. After dinner Sean arranged Tui Na massages for those interested. The clinic we went to had mostly blind therapists giving 1 hour massages. They were great and we all appeared an hour later glassy eyed and sleepy. We thought how in the States the session would have cost $80 versus the $8 that we spent. Today we waited out the rain by having a short lecture/ class with Robert on botanical nomenclature. After finding a store that sold boots, we were ready to hike up Longya Mountain. The rain subsided a bit, and the mountain was filled with misty clean air. Robert did his best to dig up roots and hunt for plants in his poncho. 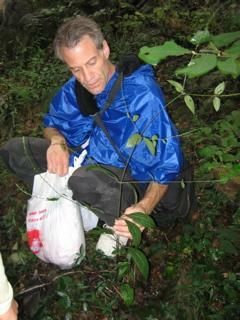 There were a good amount of common medicinal herbs growing on the mountain there. That pretty much took all day, with the evening open for free time, writing postcards and early rest. The morning started out with the Bozhou herb market, one of the largest in China. The warehouse was like an herbal COSTCO, with thousands of items for sale at wholesale prices. There was everything from scorpions to deer antlers. The locals seemed intrigued by our small troop going through the building. Not only is it strange for non-local Chinese to visit there, its simply unimaginable that people from the US would travel around the world to go there. I guess it would be like living in Lafayette, United States and seeing a bus load of Japanese tourists pile out at your COSTCO to check it out from around hte world. It was fun to wander around the many isles and explore the herbs that are not sold in the US like centipedes. Afterwards, our guides took us to their local herb store for a quick tour before heading out to their pill factory after lunch. The pill factory welcomed us with 2 large banners hanging on their buildings. There was even a local TV station there to record the event for local broadcasting. We were all excited by the amount of attention we got; we were treated like diplomats from the US goverment. Inside the plant we saw the process of taking the local farmed herbs and preparing them into powders and pills for resale. of course, most things are clinically tested and visitors and workers have to wear the lovely sterile looking uniforms. Our guides were as pleasant as ever and they invited us to dinner later at finest retaurant in town. The woner adn director of the factory said that the city's economic leader would be present at dinner and wanted to welcome the American guests in person. Before heading back to the hotel, the plant owner gave us a quick history of the onve famous city of Bozhou. not only is this area the bitrth place of Lao Tzu and Chuang Tzu (Taoist founders), as well as kung fu... But it is also the birthplace of Hua Tou, the famous Chinese Dr. who formalised Traditional Chinese Medicine. We went to visit a small shrine to him in town on the way back. Hua Tou also created a set of animal exercises that sorta resemble Tai Qi practice. Here's a pic of the owner really getting into doing one of the animal forms. It was pretty fun. The official dinner started off with a rather formal introduction, some of us felt a little underdressed, but they didn't mind. The welcomedus to their town and country and hoped that we would return again soon and bring more attention to the importance of Bozhou in the herb growing market. The dinner adn hotel was amazing. It was the best nite yet. After about 100 shots and various toasts to almost everyone... we were ready to call it a nite and asked robert if we could sleep in the next day. there was one last photo op before we left. We felt like we were part of the UN. faOur train trip to Bozhou ended and our 3 hour bumpy bus drive began. the raods are crowded and severly undermaintainded out here. This is rural China, farms are everywhere. Yet even here there are significant signs of progress and new building, including new cell phone towers in the middle of fields. We checked into our hotel, which, despite its huge number of vacancies and rural location, had the best accomodations so far. Including a great internet connection in every room! we spent the morning recovering from our travels. We spent the afternnon traveling visiting nearby farms. The local farmers were great company. The village there was small and quite poor. They invited us to look around at the herbs they were growing and showed us how they process some of the herbs locally. This place offered great insight into the chinese herbal medicine; it's where it all starts. The hospitality we recieved from the farmers was wonderful and everyone welcomed our alien presence and constant picture taking. They were digging up samples and telling us the differences in age and quality with some herbs. The family of farmers there introduced us to th eldest of the group. The man beig 90 and his wife 92! Both still looking healthy and both still working in the fields there. Everyone was sad to say goodbye to our newfound friends. After, we traveled to the display gardens just down the road. We were told that although these lands were once owned by the government, they were now sold and privatised and the herbs grown there are still subsisidized. Mr. Gou, the owner and self-taught herbalist was there to show us around and invited us to be his guest for our stay in Bozhou. The garden was quite big and had a lot to offer. We were able to see a good amount of commonly used herbs growing there. the owner and the directors were very friendly and we left there just before the rain fell. The owner and directors came back with us to the hotel and asked to guide us through the herb market and pill making factory the next day. It was a tight day, there was a lot to squeeze in. We started by hiking up Phoenix Mtn. and see herbs there. This was the last hike, so naturally we had to get separated as a group in order to keep with the tradition. It was a nice day out and the trail was lined with new slate tiles all the way. Robert grabbed a couple of samples to show us on the trail and later on the bus. During lunch we all decided that while Hangzhou is a niced city, we were ready to move on to Shanghai earlier and wanted to all have a formal, final dinner together. So we revised the schedule a bit. Next we visited the West lake tea farm. Along the drive you could see all the tea growing on the hill side. Here we met some of the local farmers who pick the green tea leaves and pan-dry it for 8 hours each day by hand. It's an arduous task and explained why the tea is expensive to produce. Then we met "Dr. Tea" who then explained all the benefits of green tea as well as the various grades there of. He was a total salesman with animated demonstrations. The teas though, tasted nice. Of course, we had to buy some, since it is hard to find good quality tea in the US. We then had to hurry to catch our boat ride on west lake. The day started off beautifully and continued that way while we were out on the water, the weather was perfect. The ride offered nice views of the surrounded hills which were dotted with pagodas and temples. In the distance you could see the modern city, a drastic contemporary contrast to the ancient buildings. It was a perfect snapshot of modern China. After the lake, we had about an hour to squeeze in any last minute shopping at the promenade in town. there were lots of paintings, textiles, handcrafts and snacks to be had. So much to buy, so little time. Then it was our last 3 hour bus ride to our final destination: Shanghai. The city was all lit up. Shanghai is a city with the height of NYC, the width of LA and the electric light overload of LV. Our hotel was located right on the end of the "Bund," an area along the river where on one bank there are all old European colonial buildings and the other all skyscrapers made during the last 10 years. It was a great drive and a perfect introduction to the chaotic city. We quickly checked into our hotel, which was all Art Deco and made in the 30's. Then it was nice final dinner together. We were all able to fit at one large table this time. After many toasts and thanks to one another we called it a night. it was great to wrap up the trip together this way. So much had happened in the past weeks, you could barely remember all the events. At this point, the traveling had taken a toll and most of us were exhausted. We had to prepare for the next day, check out and leave Shanghai at noon. A few brave souls walked around the Bund and checked out Shanghai's night life. We checked out in the morning and drove over to Nanjing Pharmaceutical University where we met Dr. Chen and the director there. They took us on a brief tour of the school and a small herb museum while we waited for the herb garden to be unlocked. No pictures allowed. While waiting a few of us wondered around campus. 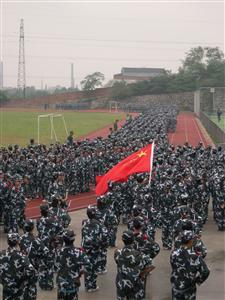 We saw a few thousand students dressed in military outfits yelling chants and marching around the grounds with rifles. It was strange to see such a presence at a medical school, we wondered if it had anything to do with the upcoming holiday: National Day. Sean told us that it was just a way of breaking in the new freshmen, in an attempt to convince them that school is serious and not a place to party. He thought it was a funny sight too... because the students have little to do with the military at all. Still, it was a frightening to see. Meanwhile DJ and Patricia were on a mission to buy one of the student jumpsuits that say "Nanjing Pharmaceutical University" on it. The campus store wouldn't sell it to them and thought that something was up, because no foreigners would want such a thing. In the end they were able to trade some stuff from the US with some students there and got the jackets. We were finally able to get into the garden and Robert took us on a tour reviewing the herbs that were growing there. We only spent a few hours there and most of it was spent wondering around the campus, which is a very different experience then that of any school in the US. Students are 4-8 in single room. Everything is cold concrete communist-style. For fun, there's ping-pong and badminton (only after marching). we then said goodbye to Dr. Chen and our local guide Sean and were off for lunch. After that we were off for another 3-4 hour bus ride to Hangzhou. This time it was a scenic, sunny drive. We saw lots of farms and then suburban developments; building was everywhere. Along the way was an awesome new rest-stop. We were able to stock up in water and some comforts of home (well, they had Lay's chips.. even if they were cucumber flavor or Italian meat-sauce flavored). We got a kick outta that place. Then it was back on the bus. We arrived in Hangzhou in the evening. Before checking in at the hotel, we met our local guide Jerry and went to visit a silk factory. It was pretty cool to see how all these tiny filaments are spun into thread and then spooled into what looks like cob webs. It's quite strong when massed together. The guide showed us the way to determine whether silk is pure or not: you burn it.... Umm, OK. If it's white smoke, it's real, black it's not. Good luck trying that one at Macy's. Naturally, there was a silk store next to the factory which had anything silk you could want. Some people bought some bedding, but most of us just wanted to checkin and pass out. PM Tong Ren Tang pharmacy Herb dinner in Qin Shan Fang Restaurant. We're gonna stay at the 3 star Nine Dragon hotel for 4 nites. Full day at Chengdu's Traditional Chinese Medicine (TCM) college and hospital. In the evening we had the hot pot dinner. AM: Herb Museum, DuFu poetry garden. PM: Xin Hua book store. AM: Visit Panda Breeding Center, way cooler than any zoo. If you love cute fury critters, don't miss the panda reserve, especially the baby nursing area. Go rain or shine, it's not to be missed! Also check out the red Pandas (the lesser panda), they are sometimes overlooked, but you can pay to hold and pet them! 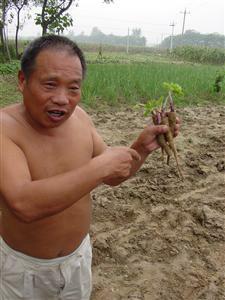 PM: Drive to Emei Shan (Emei Mountain) area and see local Herb Farms. 3 star Emei Shan hotel. Also, take a dip in the lovely and huge hot springs around the corner! They even had herbal baths to take a dip in. You can even buy a pair of retro swimming trunks for a few bucks, sweet.